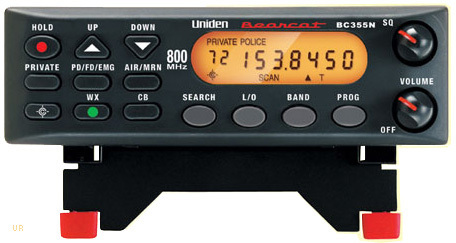 The Uniden Bearcat BC355N is a scanner covering 13 preset search bands including VHF Air and the 800 MHz Public Service band. It has six service banks plus 300 user-programmable private channels. It is preprogrammed and is user programmable. It features Uniden's famous Close-Call technology to automatically tune strong nearby signals. The scan rate is 50 channels per second, search rate is 60 or 180 steps per second. Advanced features include: Turbo Search, one-touch weather and channel lockout. The rear panel has a BNC antenna input jack and a 3.5mm mini external speaker jack. The bottom of the radio has a flip-out tilt-stand. Size: 5-3/16”(W) x 5-3/4”(D) x 1-5/8”(H) 1 lb 6.5 oz. This radio comes with: BNC type telescopic antenna, flexible antenna, AC adapter, cigarette lighter DC power cord and BC355N Operating Guide.